Southport, Connecticut – Sturm, Ruger & Co., Inc. (NYSE:RGR) announces the introduction of “ShopRuger.com,” a new on-line storefront for Ruger Sportswear and Accessories merchandise. ShopRuger.com provides Ruger customers with an enhanced shopping experience, incorporating a new look and features that will simplify the ordering process. Finding exactly what you’re looking for is a breeze with the new ShopRuger.com. A redesigned navigation bar allows a user to jump from one section to another without having to use the back button, and a new, fully functioning search feature provides an even faster way to locate specific items. Users can search by item number or key words, such as “SR9,” and will automatically be provided with a list of all items related to that search term. 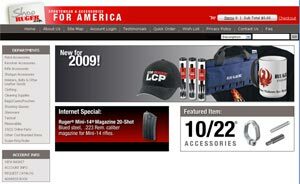 Frequent Ruger sportswear and accessories shoppers will appreciate the ability to create a profile on ShopRuger.com. Profiles enable users to retain shipping and billing information for future orders, maintain a wish list for family and friends to view, and track the status of their orders. Find an item that you think is perfect for a friend? Users can now forward that information to anyone, along with comments, without ever leaving the store. Aside from the new look and features of ShopRuger.com, new products are consistently being added to the on-line store. From top line accessories for the new Ruger SR-556™, to 60th Anniversary hats and memorabilia, Ruger fans will find a product that fits their needs. Clothing is available for men, women and children, holsters and other firearm accessories are offered to accommodate most of Ruger’s diverse product line, and some firearm parts are even available for purchase. Let ShopRuger.com be your first stop when searching for the latest Ruger merchandise! To check out the new home for Ruger Sportswear and Accessories, visit www.ShopRuger.com . The store is still easily accessible through the Ruger website, www.ruger.com, where information is available on the extensive line of American-made Ruger Firearms.